Every man, woman and child tells lies at some point or another. Sometimes it seems like it’s so much easier to lie than it is to tell the truth and dig yourself into even deeper trouble. Lies tend to just roll so easily off the tongue at times, especially when a woman asks you one of those terrible questions where you’re damned if you do, damned if you don’t and you’re just not sure how to answer to avoid an argument. Women usually lie to make a man think one thing about them when it’s actually another, or to impress someone whose opinion they value. Women will occasionally lie about where they got their outfit because they don’t want other women looking down on them for where they purchased it, and occasionally they’ll lie about where they live to make themselves seem more well off than they are. Though, there are three big things that women seem to lie about more than anything else, and these are their weight, the number of sexual partners they’ve had, and what they do for a living. This is the thing that women lie about the most, hands down. It’s such a source of insecurity for both women and men, especially in a society where appearances matter at every moment of every day. She’ll get on the scale and make a big fuss about what number reads out on the screen, but if you ask her what’s wrong she’ll say it’s nothing and then feed you a line about how she’s actually closer to her weight loss goal. If she’s frequently lying about her weight, you can reassure her by telling her how gorgeous she is all the time and telling her how much you think the outfits she’s been wearing recently flatter her. 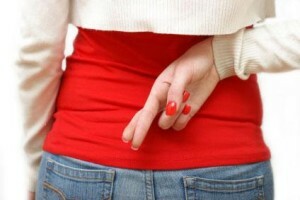 Many women will also lie about the number of sexual partners they have had in the past. With a society that demonizes women for how many men they’ve slept with, most women are terrified of being seen as slutty and not as worthwhile to the men they want to impress, so they’ll often lie about this. This can be a serious issue because of a possible concern and risk for diseases, so if she seems hesitant or uncomfortable when discussing the number of sexual partners she’s had in the past, you might want to take extra precautions when you sleep with her. You’ll also find quite a few women lying about what they do for a living. If they think that their job is a traditionally masculine one, they might be hesitant to tell you just because they think you might not think they’re feminine enough to date. It’s silly, but you’d be surprised how many women think like that. If their job makes them unhappy, too, they’ll lie about it so they can fantasize that they work somewhere else that doesn’t make them miserable. She might lie about this once but chances are after a bit more conversation, she’ll come clean and admit that she wasn’t honest in the first place, and you’ll get the truth.